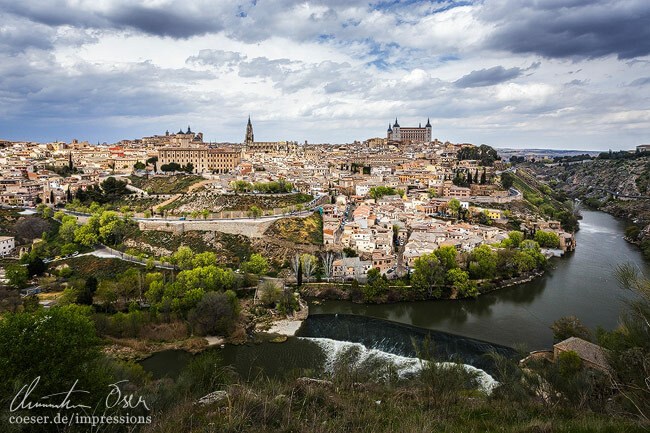 Panoramic view of Toledo and the Tajo river. Panoramaansicht von Toledo und dem Fluss Tajo. 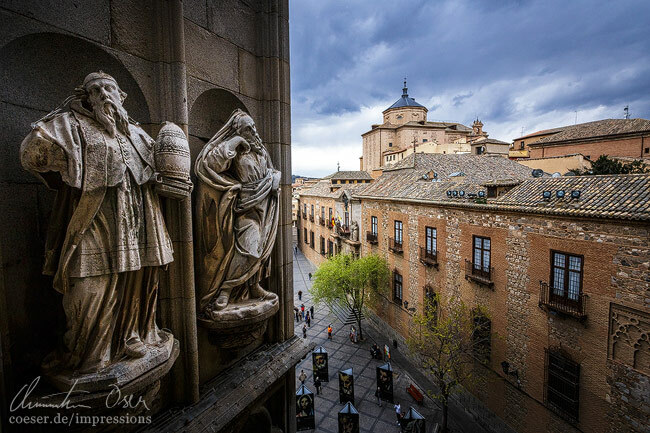 People walk through a street with a view of the Toledo Cathedral. 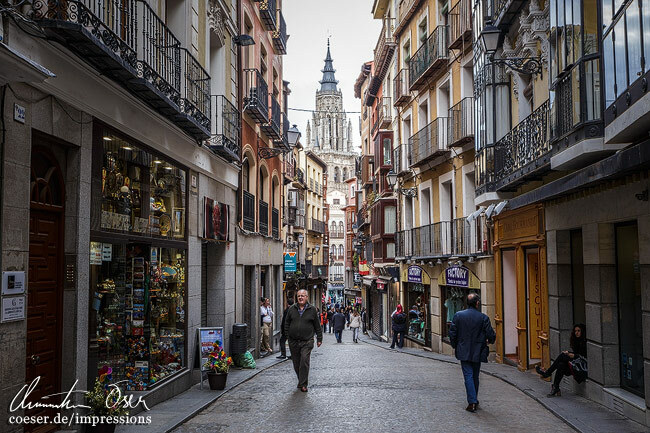 Menschen spazieren durch eine Gasse mit Blick auf die Kathedrale von Toledo. Two statues inside the cloister of Toledo. Zwei Statuen im Kloster von Toledo. 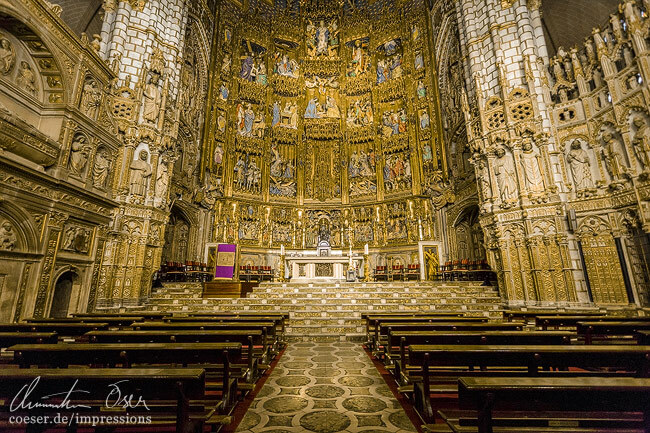 Detail view of the Retable of the Cathedral Santa Iglesia Catedral Primada. Detailansicht des Hauptaltars in der Kathedrale Santa Iglesia Catedral Primada. 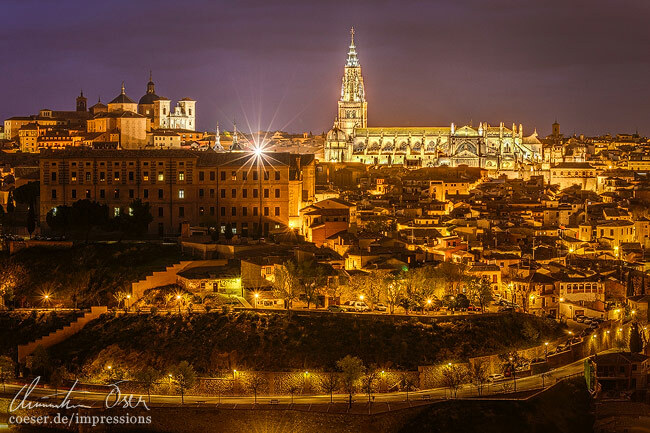 The illuminated Cathedral Santa Iglesia Catedral Primada and its surrounding area. Die beleuchtete Kathedrale Santa Iglesia Catedral Primada und Umgebung. 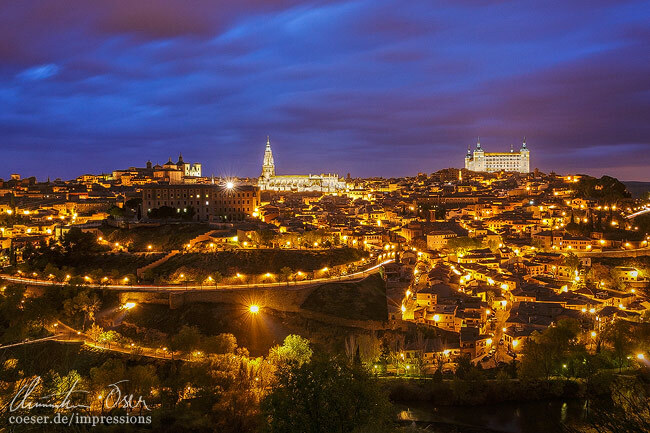 Panoramic view of the illuminated historic city center of Toledo. Panoramaansicht der beleuchteten Altstadt von Toledo. 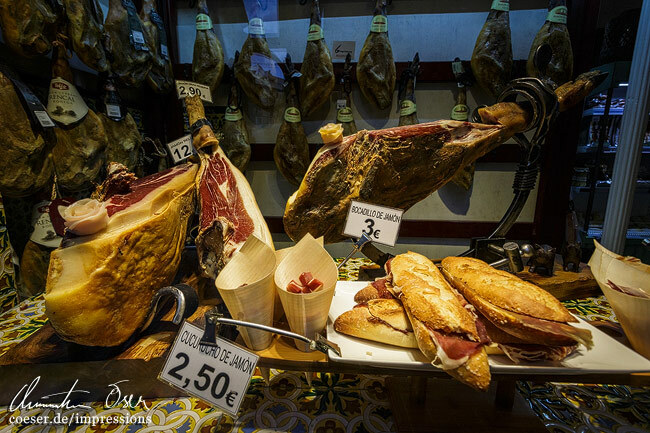 Ham (Jamón) in a window display of a local butcher shop. Schinken (Jamón) in der Auslage einer Fleischerei. 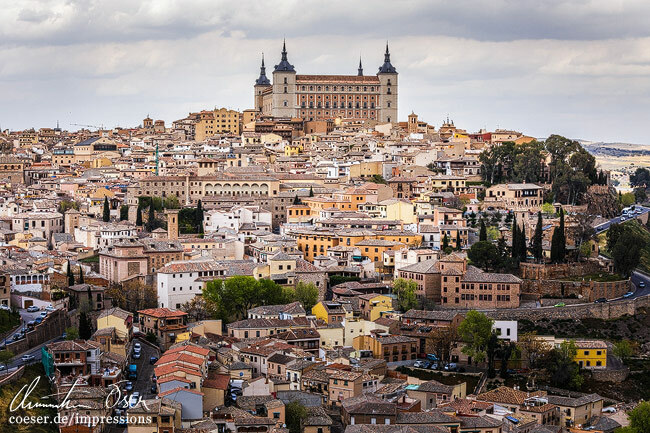 The Alcázar of Toledo fortification on top of the historic city center. Die Festung Alcázar über der Altstadt von Toledo. 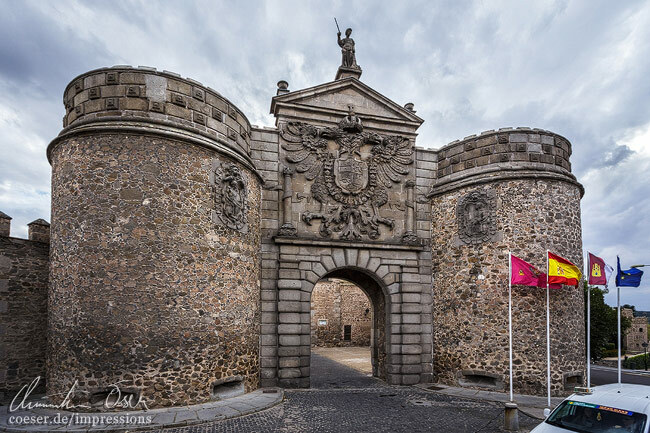 The Puerta de Bisagra city gate. Das Stadttor Puerta de Bisagra. 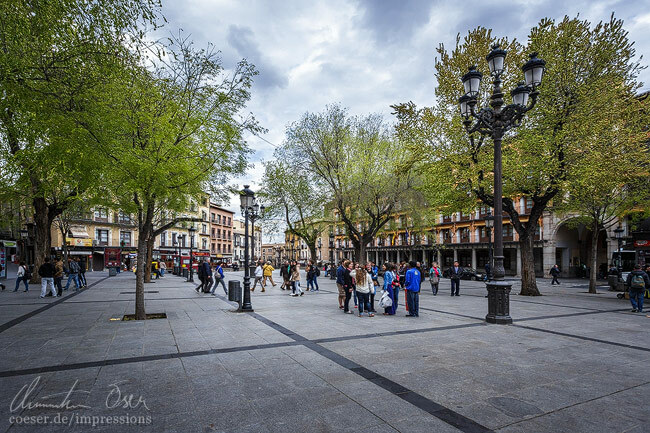 General view of the Plaza de Zocodover. Der Plaza de Zocodover in Toledo.